Thanks to its entry-level programme, Air Share offers an ideal and affordable solution for companies with travel needs. You will be able to travel from the Southeast England to other parts of the UK and Continental Europe reaching your destination in fast comfort. Flexibility is offered to you as you can become a shareholder of a twin piston, a turboprop or a jet. Air Share offers made-to-measure solutions in order to meet the customer's profile and travel expectations. Fractional ownership is a viable solution for clients with moderate expected utilisation requirements and those having a diverse mission profile (depending on types of aircraft in the fleet). 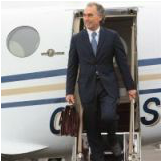 Most successful businesses depend on efficient travel for their executives and senior management. Many have turned to owning and operating their own aircraft as an alternative to using airlines. However many businesses feel they are too small to justify sole ownership of an aircraft and hesitate to commit the additional resources needed to manage them. The cost and organisational hurdles can put companies off.